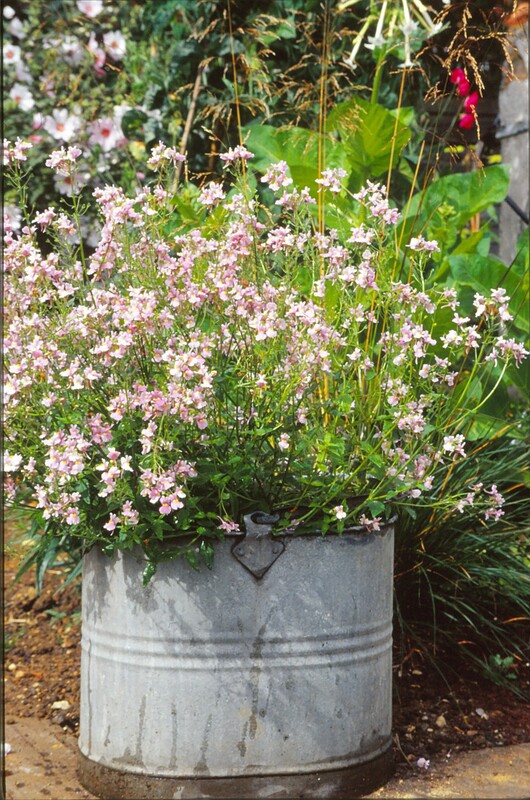 Now that weather has finally warmed up at long last, it’s time to plant up containers with beautiful summer-flowering tender plants. In this post I cover how to get started with containers; some of my favourite plants; and practical tips on planting and care. Containers are fantastic for personalising your patio and brightening up any soil-less spots outside your home. It’s the nearest thing to magical ‘instant’ gardening and at this time of year the nurseries and garden centres are packed with tempting plants. 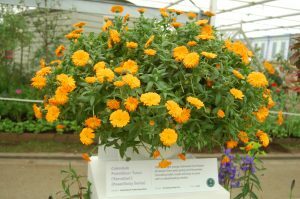 Whether you prefer summer blooms in cool pastels or brilliant colours; sophisticated foliage or portable perfume; permanent plants or seasonal spectacular blooms; fruit, vegetables or herbs – there really is something for everyone. First choose your pots, if you don’t have some already. There’s a huge range: terracotta, plastic, glass fibre and wood are the main ones – in a wealth of sizes, shapes, even colours. Whatever takes your fancy, I do advise keeping it simple rather than ending up with a mishmash of different pots. 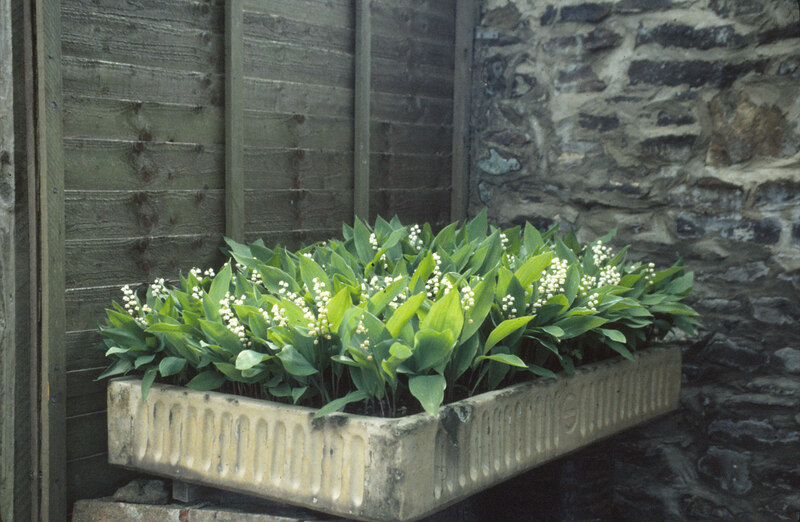 The main choice is down to what you like the look of and your budget, though do choose frost-proof for pots that will be outside all year. But containers needn’t cost much at all – perhaps even nothing whatsoever. Because anything that can hold compost and have drainage holes made in it (hugely important, this) can become home to plants. ‘Upcycle’ old mop buckets, wheelbarrows, water tanks, sinks, canvas shopping bags, even old baths, toilets and shower trays, to create a quirky and truly personal garden. The options are almost limitless. Chalk paint, beloved by furniture up-cyclers, can be used outside too and is brilliant for a near-instant transformation. The key item not to skimp on is the potting compost, because when you’re growing plants in the ultra-confined space of containers, they need really good stuff if they’re going to perform at their peak for many months. 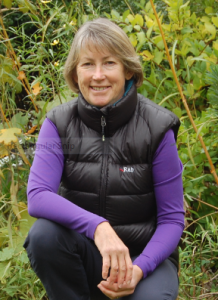 Sometimes this is a hard mental bridge to cross, though – back in my garden centre days, I was regularly amazed by people who’d spend upwards of £50 on a couple of splendid plants and containers, then ask if it would be okay to use garden soil…….. So which compost to choose? Multipurpose potting compost is fine for short-lived summer plants, but this type degrades over time. For long-lived plants like shrubs, conifers, palms, lilies and so on, it’s well worth the small extra cost of soil based type such as John Innes no 3. Before buying or up-cycling masses of pots, do think ahead to the amount of care they’ll need. I always say that plants in pots are like pets – they rely on you for everything, and especially water. There are ways to cut down on the work of watering, though. Large containers need less frequent watering than small ones plus, grouping pots together so they shade each other slows water loss too. A simple patio irrigation system is well worth considering, especially for holidays. Remember to feed as well as water: a controlled release fertilizer can be applied just once or twice during the growing season. Removing dead flower heads keeps the season going for longer too. And so to plants: but oh, the choice! Traditional favourites like geraniums, fuchsias and petunias can be found aplenty, in dozens of different colours, and there are heaps of other newer plants on the scene too. Here are just a few of my top choices – but there’s loads out there, so do explore further! For brilliant flower power, begonias bloom from mid-summer right until the frosts. The old favourite ‘Non Stop’ types are still around, but I love the newer, bigger, bolder varieties. Like the aptly named Begonia ‘Big’ series which looks like a magnificent supersized version of the little Semperflorens bedding types. ‘Dragon’s Wing’ has bold, dark leaves and red flowers; while ‘Glowing Embers’ is brilliant orange. 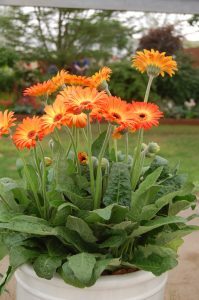 Gerberas with huge ‘daisy’ flowers, once only to be found in the houseplant section, now have a hardy counterpart in the Gerbera ‘Garvinea’ series. The term ‘hardy’ is relative though – while they will come through a winter that isn’t too harsh, they’ll only survive a few degrees of frost. New Guinea Impatiens has been the only ‘busy lizzy’ around for years as the traditional old favourite type succumbed so badly to downy mildew disease that most growers dropped them altogether. But now gardeners can buy this much-loved plant again with the arrival of Impatiens ‘Sweet Amara’ which has excellent disease resistance. Another new take on an old favourite is Thompson & Morgan’s stunning sunflower SunBelievable ‘Brown Eyed Girl’, said to bear up to 1000 flowers and, at 60cm high, is perfect for pots as well as borders. Pastel shades, delicate flower shapes and silver foliage are enchantingly pretty crowd-pleasers that suit almost every garden. Nemesia and Diascia are two similar groups of plants that have really blossomed (pardon the pun) in the hands of plant breeders and now there’s dozens of delightful varieties in shades of white, yellow, pink and blue. Large enough to hold a pot alone, but also gorgeous mixed in with other plants like verbenas and that standby filler, trailing lobelia, which threads its slender stems through other plants with a light touch. A little bigger and bolder, Cosmos is one of my must-grow plants both for containers and a gap-filler for borders. Pinks are pretty, but whites are an essential for the large blooms that stand out in the dusk once everything else has faded into the dusk. Either the shorter ‘Sonata White’ or taller ‘Purity’ are fail-safe good doers. 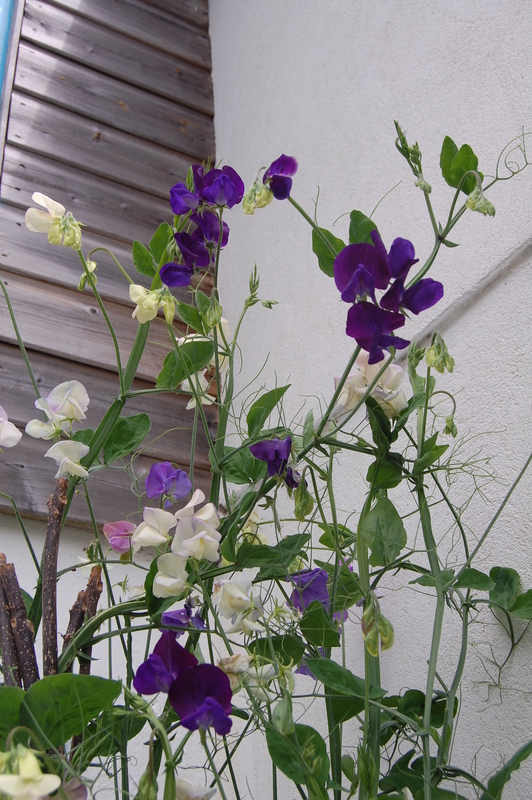 Heading yet higher, tall-growing sweet peas can make a fantastic display in large, deep containers (which should be a good 40cm or so deep). Growing up to 1.8m high, the scented blooms are heavenly placed right next to a window or doorway where the fragrance drifts inside on warm summer days. Make a diary note to sow sweet peas in autumn: you’ll get stronger, sturdier and earlier-flowering plants than those sown in the spring. 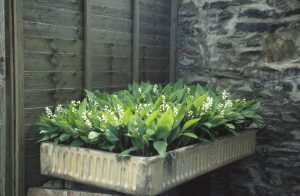 Before finishing this post, mention must be made of the many long-lived, easy-care plants which are superb in containers. These are the foundation plants on my patio and look wonderful from year to year with very little maintenance apart from watering and feeding. There’s plenty to say on the subject so I’ll cover these in a future post. Happy potting!